Empathy is the capacity to understand and acknowledge the feelings, thoughts and behavior of other people. Empathy is usually characterized as an emotional reaction to other people’s emotions, usually in a state of distress. Empathy means to feel and understand other people’s personal world as if it were our world, but without losing our own selves. That is, experiencing the mental, emotional and behavioral state of another person while completely separating ourselves from that person. In other words, a person’s ability to “step into someone’s shoes” temporarily, not out of identification with them but out of an understanding of their difficulties and emotions, thus providing support. Empathy develops on the basis of a capacity called mentalization – a social cognition that allows us to visualize the mental activity of others and of ourselves in terms of desires, feelings, needs, goals and so on. 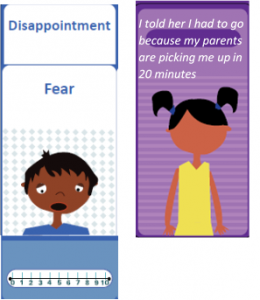 Children who grew up in a non-validating environment and were not given the opportunity to express their feelings in an open and accepting manner, and who were conveyed the message, not always consciously, that there is no place for “non-functional” emotions and thoughts, will experience difficulty in developing a capacity for mentalization, understanding their own and others’ mental states and separating emotions. Empathy is one of the most important social skills for a person who wishes to maintain social relationships. When we are able to empathize with our friends, we can understand situations that do not necessarily correlate with our current emotional state, and in spite of this, we can still support them. In an argument between friends, each side usually perceives the situation from their own point of view and may find it difficult to acknowledge the different thoughts and emotions of others, especially if the subject overwhelms them emotionally. The goal of therapy is to succeed in expanding the patient’s ability to implement mentalization even in emotionally intense situations. This is done by helping the patient to identify his thoughts, emotions and beliefs and examine how they affect his behavior, especially in emotionally overwhelming situations. Children who experience difficulty in their capacity for empathy, often have a hard time maintaining friendships since they fail to recognize the feelings of others and therefore can’t attain closeness and a sense of mutuality. 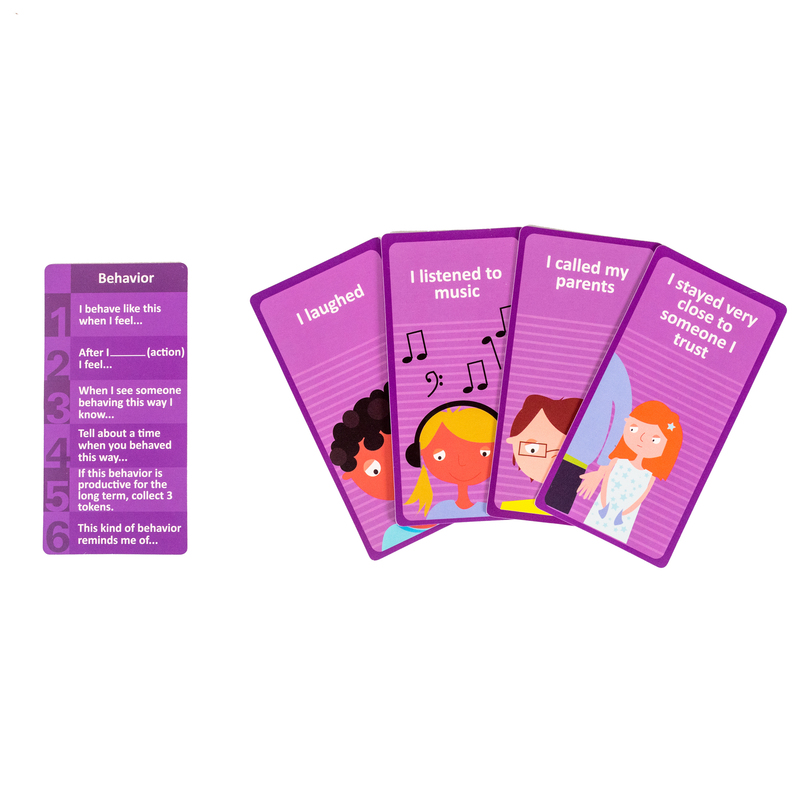 By using the Playing CBT cards you may practice mentalization. For example, a 10-year-old girl who came to me due to social skills issues, with a difficulty in understanding her own inner world as well as a difficulty in understanding others. 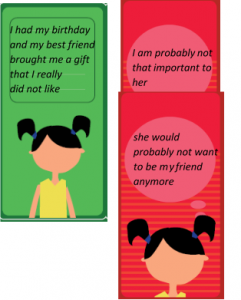 At this stage we dealt with the personal experience of the girl who received the gift. Together we examined the reason for her reaction, her thoughts and feelings. The ability to examine these elements does not come naturally to children who have difficulty with mentalization, since they have trouble identifying and examining their own inner experience. Often, when a patient finds it difficult to examine their experience, I begin with a story that enables them to dissociate from the experience and hence examine it (usually through comics). Then I let them examine their experience based on this externalization model we jointly created. The next step in our session was to develop the ability to recognize that someone else feels differently and thinks differently. We took the cards again and I asked her to write down the same story, but this time from her friend’s perspective. Patient: “Yes, because I thought that I wasn’t important enough to her and therefore she didn’t put enough thought into my present. Maybe she did put a lot of thought and effort, but I jumped to wrong conclusions and tried to run away from the situation”. Patient: “Wow, I’m not sure. Maybe next time I’ll be able to stop for a moment, examine my thoughts, feelings and physical sensation , take a couple of deep breaths, and remember that my thought is not necessarily true. 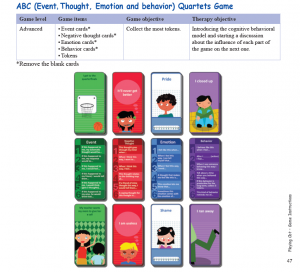 You may also use the quartets game (game no 11) to practice the model and teach about the different elements of the cognitive behavioral model, which will contribute to the development of the child’s ability to understand his/her personal experience as well as the experience of others.